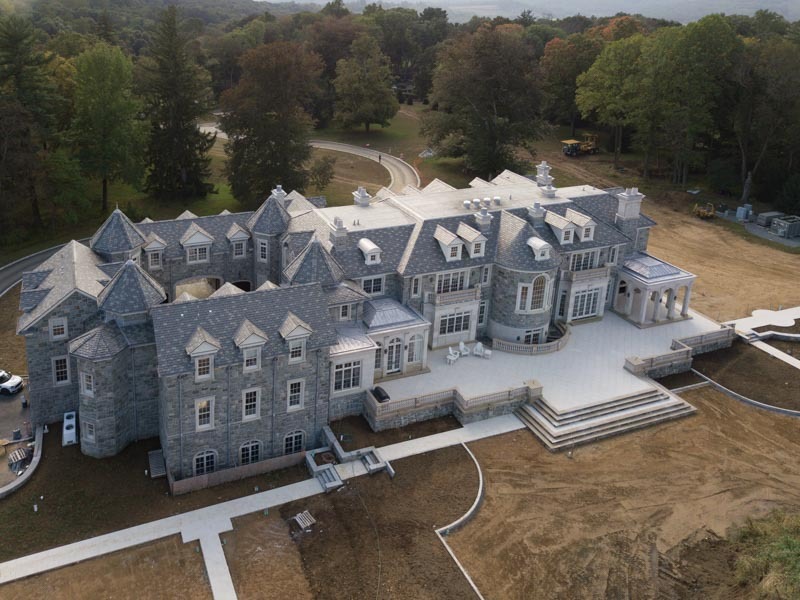 The complete roof area is 14,000 square feet. recommendations. 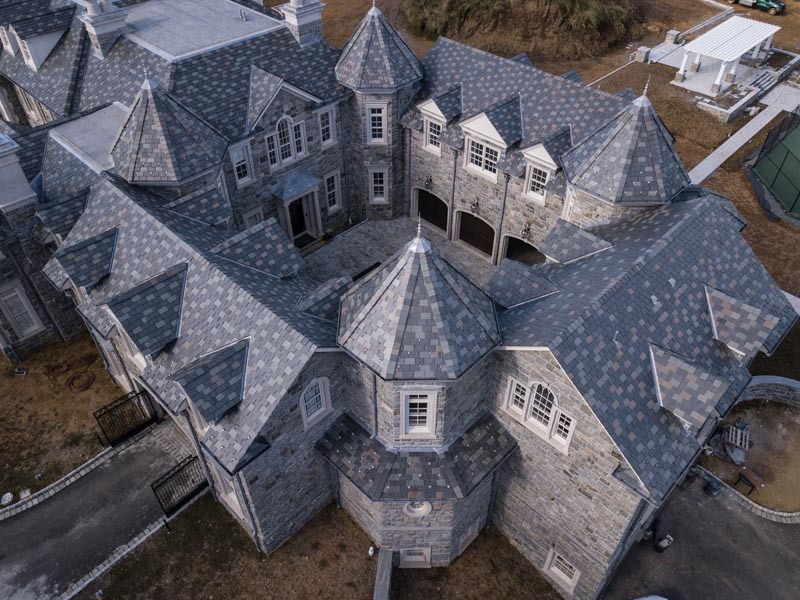 An additional layer of roofing underlayment was installed which complies with ASTM D 226 asphalt-saturated rag felt, Type Il #30 as per manufacturer’s recommendations and the SRCA. The felt was laid in horizontal layers with all joints lapped toward the eaves and drains with at least a 3″ overhang and a minimum overhang of 6″ at the ends. The felt overlaps all hips and ridges by approximately 12″. The felt is secured along laps and at ends as necessary to properly hold the felt in place and protect the structure until the slate was installed. 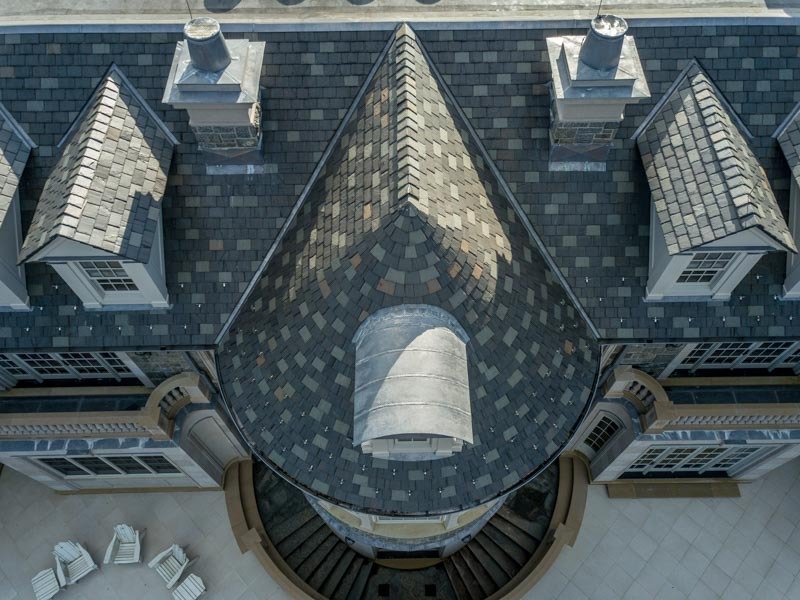 The slate pattern consists of 90% Vermont Black and 10% Weathering Light Grey.All slate extends 2″ at the eaves and 1″ as directed at all rakes, and is laid in horizontal courses. A 3″ minimum head lap was maintained between succeeding shingle courses for roof pitches of 6/12 or greater. Slates at the eaves or cornice line are doubled using same thickness slate for under eaves at first exposed course. All slates overlapping any sheet metal work have the nails placed to avoid puncturing the sheet metal. All slates were fastened using 10 gauge copper slating nails. 20 oz. lead-coated copper flashing was installed according to “The NRCA Roofing and Waterproofing Manual”. We maintained a 3″ minimum head lap between succeeding shingle courses for roof pitches of 6/12 or greater and a 4″ minimum head lap between succeeding shingle courses for roof pitches of 4/12 and 5/12. The slate courses between eaves and ridges maintained uniform exposure. Each slate was hung with two slating nails for each shingle with nail heads lightly touching slate. Nail heads do not protrude or interfere with overlapping shingle above. All ridges were installed as a Saddle Ridge. All hips were installed as a Boston Hip. All open valleys were installed as follows: All slate was cut to form straight lines at open valleys, trimming upper concealed corners of shingles. All slate maintained a uniform width of exposed open valley from highest to lowest point. 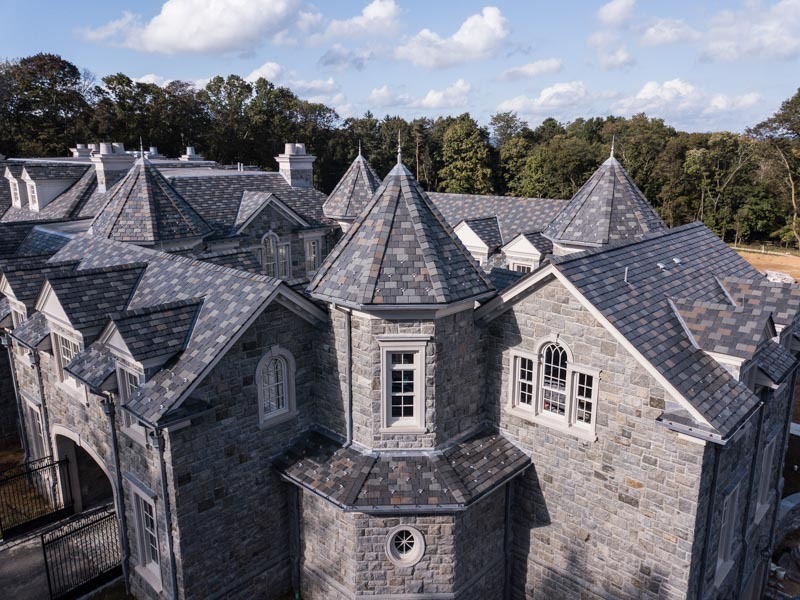 All closed valleys were installed as follows: All slate were cut to form straight lines at closed valleys, trimming upper concealed corners of shingles. All slate maintained a uniform gap at the centerline of the valley. All Step Flashing was installed with a 3″ head lap, extending over the underlying slate shingles and up the vertical surface. The roof structure was designed to sustain maximum wind pressure load of 100 psf. The roof panels and connections accommodate movements of the structure due to wind forces, shrinkage, expansion etc. All cleats are 16 oz. cold rolled sheet copper, 2″ wide by 3″ long, one end locked into the seam and other end double nailed and folded back. Supply and installed 6″ 20 oz. lead-coated copper ogee copper seamless gutters with noncorrosive screw and ferrule anchors (l per rafter). Supply and installed 3″ x 4″ plain smooth rectangular 16 oz. lead-coated copper downspouts with matching leaders) hangers (3 per leader: 1 at top, I at any intermediate bends or centered top to bottom and I at the base). Supply and installed decorative copper leader heads set 3″ below eave trim at each exposed roof leader. Leader heads are “The Warwick” as manufactured by Copper Craft.